Working for one of the Big Four firms is a dream of almost all finance professionals. The work that these companies do, the clients they serve, the kind of money they pay to their employees and the status of working with these firms have inspired and motivated countless aspirants over years to be a part of these firms. Today in this article I am going to tell you all you need to know about getting yourself placed in one of these firms. I am also going to tell you what jobs are usually offered, including internships and the compensation offered. Why Do You need to Know about the Big Four Accounting and Consulting Firms? The first and foremost reason to know about these firms is simple – they are the best place to work in. As a finance aspirant, if you want to have a successful career in finance you need to have an aim of working with one of these firms. If you know what it takes to be in these companies, your career will start with a direction. And, when there is clear direction you will not lose track in your (career) path. If you do not know about these companies well in advance, you might lose out on opportunities of working in the best of companies. You will be far behind – in terms of preparation, skills and knowledge – the other aspirants who actually know how to approach these companies for jobs. Now, let me provide a quick introduction of each of these Big Four firms. Deloitte Touche Tohmatsu Limited, most commonly referred to as just Deloitte, is the world’s largest professional services network in terms of revenues and number of employees. In the financial year 2012 and 2013, the company recorded revenue of more than 32 billion dollars. It is highest amongst the Big Four firms. The company provides services related to financial advisory, tax, audit, enterprise risk and consulting with a workforce in access of 200,000 in more than 150 countries. The company is headquartered in New York City, United States of America. For more information, please visit Deloitte website. PricewaterhouseCoopers, most commonly referred to as PwC, is a multinational firm that offers services ranging from tax advisory, financial advisory, audit, actuarial, consulting and legal services. In the financial year 2012 and 2013, the company recorded revenue of 31.5 billion dollars with a workforce of more than 180,000 professionals around the globe. The company is operational in 159 countries with offices in 776 cities, headquartered in London, United Kingdom. PwC United States is the fifth largest privately owned company in the United States. For more information on PwC, please visit the website. Founded in 1849, Ernst & Young, most commonly referred to as E & Y or EY, the world’s third largest professional services firm. The company recorded revenues of more than 25 billion dollars in the financial year 2012 and 2013. Headquartered in London, United Kingdom, the company is operational in more than 700 cities across 150 countries with employee strength of 175,000 strong. The company offers services related to assurance, taxation, financial advisory, financial audits and consulting. For more details on Ernst & Young, please visit the website. Headquartered in Amstelveen, Netherlands, KPMG is the last of Big Four firms. In the financial year 2012 and 2013, the company recorded revenue of a little more than 23 billion dollars. It has more than 150,000 people working as full time employees across the world. The services offered by KPMG include audit, tax, risk management, financial advisory and consulting. It has large workforce in countries like United States, United Kingdom, China and India. For more details on KPMG, please visit the website. Now that we have known a little bit about these companies, let me tell you about various jobs and profiles offered by these firms. In this section, I am going to tell you about the hierarchy of an accounting and consulting firm and the career progression thereafter. I will be focusing more on the entry level profile as this is where you are most likely to start your career and depending on your performance and experience you will grow in the organization. 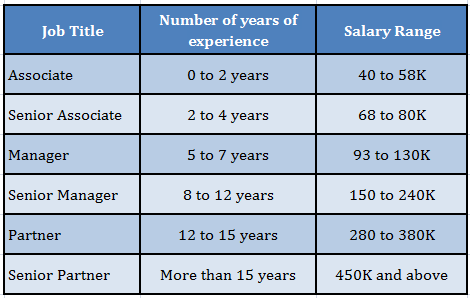 This is the entry level job offered in Big Four firms. An associate is typically a candidate straight out of college with a graduate or maters degree. But there are many candidates who have prior work experience and then join these firms at the level of an associate. Accounting associates are typically accountants who support their senior level auditors and accountants with bookkeeping, accounts receivables and accounts payable, clerical and administrative duties. Their major responsibilities include processing and recording client invoices into the accounting software and systems. They also code payments, prepare reports and maintain accounts ledgers. These professional interact with the vendors, and various departments within the company for their day to day tasks. Typically a degree in accountancy or related field should get you a job of an associate, but there are instances wherein companies have recruited people from other disciplines with at least 2 to 3 years of accounting experience. Any accounting professional has to be proficient with numbers, mathematics and statistic. You have to be good in data entry and should have a keen eye for detail so as to perform your job efficiently. Basic knowledge of Microsoft Excel & Access is necessary in addition to accounting standards and principles. The job responsibilities of a senior associate are quite similar to that of an associate, but the quantum is different. A senior associate is usually a go-to-man or team lead within the group of associates with thorough understanding of their work. There are a few added responsibilities like preparing presentations, creating advanced reports and acting as guides for the newly appointed associates. Two to four years of working experience as an associate should get you promoted to a senior associate. As the name suggests, it is a managerial position wherein you will be required to manage and supervise a team of associates and senior associates. You will be responsible for performance appraisals, motivation and many times hiring new resources in your team. At this position you will not be working on the basic tasks revolving around data and numbers. Here the responsibilities are more towards project management and improving the operational efficiency of the team. 5 to 7 years of working experience is required for a professional to get promoted to this position. The job responsibilities at the level of a Senior Manager are completely different than the three levels that we just discussed. At this level, you will be responsible for getting more business and nurturing the current relationships with the clients. The involvement in operations is minimal at this level and the tasks revolve around client management. Senior managers usually travel to places and meet clients at regular intervals. The tasks involved in this job are making presentations to the clients, getting deals and nurturing client associations. This is a very senior position in any accounting and consulting firm. At this position you will be in charge of functional units and many times even a geographic location. One needs to have at least 12 to 15 years of working experience to be at this position. This position belongs to the cadre of senior management and involves great deal of responsibility. A partner in Big Four firms is a very respectable position and cannot be achieved without hard work and robust industry experience. A senior partner is someone who will be involved in all the strategic decisions made by the firm. This is the highest designation that one can achieve in any professional services firm. Senior partners have more than 15 years of working experience are in literal sense the stalwarts of the industry. The salaries can depend on multiple factors like profile function, educational background, location and special skill set. Here, I am going to tell you about the salaries offered in the United States of America. Typically the salaries offered by the Big Four is higher than the industry standards. This is obvious as the selection process is very stringent and very few applicants get a job when compared to the number of applications. In this section I am going to tell you about the various internships offered by Big Four firms, internship salaries and expected salaries post internship. Internships in Deloitte can be toiling at times. Whether it is an off season or during the season, working past regular office hours is very common in Deloitte. An internship during the busy season is always demanding but a great learning experience. In addition to the routine tasks these internship involve a great deal of responsibilities. An off season internship will not be that demanding since the responsibilities would be less. However, there still would not be a work life balance as you will be expected to work long hours without overtime pay. Having said that, still, Deloitte is one of the best places to work as an intern as you will learn a lot about the industry working with dedicated and smart professionals. The average internship salary here would be somewhere around 3,700 to 3,900 dollars. If you are hired as an Associate after the internship you starting salary would be in the range of 52,000 to 53,000 dollars. Internships in PwC are also toiling with loads of work, but the work culture compensates for the stress levels. It is one of the best companies to start off your career and you will learn a lot during your internship. Working for a company like PwC will ensure steep learning and it is a very good place to make industry connections and networks. The company makes sure to give you enough holidays for vacations after a busy season, and relatively the employees are happier here when compared to other Big Four firms. The internship programs here are very well chalked out and if you decide to move on after the internship, the name of the firm on your resume will carry a lot of weight. A successful internship with PwC in a way ensures a head start in your finance career. The average internship salary here would be somewhere around 4,800 to 5,900 dollars. If you are hired as an Associate after the internship you starting salary would be in the range of 52,000 to 54,000 dollars. Internships in E & Y are loaded with learning experiences. The best part about the company is that they take care of all its employees on the front of work life balance. The company provides enough flexibility to its employees so that they do not lose out on life beyond work. The company actively encourages relationships within the organization so that the employees feel involved and satisfied. The negative part of working in the company is that you might not always be recognized for a good job done. Since the company is large, sometimes your efforts might go unnoticed leaving you with a feeling of insignificance. However, it is worth it for such a big name on your resume. The average internship salary here would be somewhere around 4,200 to 4,300 dollars. If you are hired as an associate after the internship you starting salary would be in the range of 54,000 to 55,000 dollars. Internships in KPMG are well laid out ensuring that the interns are not loaded too much so that they can learn alongside their routine work. The benefits of working here are same as for the rest of the Big Four companies with one added advantage. Every intern at KPMG is assigned a mentor that is responsible for the intern’s development. That person will be your go-to-man and you can walk up to him at any time for anything. The company also conducts a lot of networking sessions for its employees to interact with the outside world, which clearly is the need for overall development. The average internship salary here would be somewhere around 3,400 to 3,500 dollars. If you are hired as an Associate after the internship you starting salary would be in the range of 57,000 to 58,000 dollars. Set a goal –This is the first step towards getting a dream job in one of your dream Big Four companies. Read up on the companies and choose one which suits you the best. This should be done keeping in mind the kind of work the company does, the jobs that the company offers and the work culture of the company. A company might be suitable for you but not for someone else depending on the above mentioned parameters. Start off with setting yourself a goal to achieve in the next 20 years of your professional life. The advantage of setting a goal is that after a few years you should not regret your decision of joining the company. Acquire the required skills – This is the second step that you should take very seriously. After you have chosen the company and the profile you want to work in, get the required sets to get the job. For example many of the profiles offered by Big Four require you to know financial modelling. If you are not comfortable with the concept of financial modelling, get a full time or online course to get expertise in it. If you are not an expert in a core competency required to do your job, you might get frustrated after some time. Or even worse you could fall behind of competition in the company. Believe me, your peers would be best brains in the industry and in order to compete with them you do not want to be unprepared. Create a strapping resume – Once you are fully prepared to take up a job, it’s the time to start preparing a resume that would get you in one of these companies. A resume should be an executive summary of you and should not be too lengthy. Typically people interviewing you for these companies will be busy men and women, and would not want to go through a 6 page resume for hiring an intern or a fresher applicant. As they say, first blow is half the battle – creating a solid resume is getting it half way through. The better the resume the better your chances of facing an interview. Your resume should highlight your core strengths and skill sets. Do not get carried away and start a self bout in your resume. Keep it short and to the point. Check the company website for openings – This is the first step towards applying for a job or internship. Many a times, companies do not go to any job portal or placement agency. Many a times, there is an urgent requirement in the company in which case the opening is posted on the company website. Keep a regular tab on the company’s placement page. If you chose to ignore this, you might end up not even knowing of a job opening in these companies. If there is an opening of your choice, apply immediately! As these companies are a most sought after in the industry, there will be hundreds of applicants trying to get a place in. But keep your hopes up and keep applying with improved resume. Networking – If you are a fresh graduate out of the college, go through the alumni base of your institute. Get hold of anyone who has or is still working in your target company. If you could personally meet or talk to the person, nothing like it. But if it is not possible, get in touch with these people over social media. There are tons of avenues like LinkedIn, FaceBook and Pinterest for you to keep in touch with these people who might help you get your resume through to the right person. This is one of the most effective ways of getting a shot at the interview. Prepare for the interview – Last but, by no means least, is the preparation after you have gotten a call back from the company. This is a golden opportunity and shouldn’t let it go just because of lack of preparation. From the time you get a call for the interview, till the actual interview day you should be preparing yourself for it. Brush up your concepts from college, revise basic finance concepts, prepare for questions of your projects in college and get clarity on your professional goals. These are the most common questions you will be asked in any interview. One small but very important tip for the interviews – Be Honest! Don’t be afraid of saying that you don’t know the answer to a particular question. Don’t try to fool the interviewer, as in all likelihood, the person will have tons of experience behind his/her back and must have dealt with hundreds of applicants like you. Do not try to fool them. Get ready and create a goal for yourself – Decide on the company and profile that you need to work in. Get the required qualification – If you are a fresher, apply for courses that will enable you to get to your dream job. If you have already taken those courses, brush up your concepts. Create a strapping resume to apply in your dream company. Check the company websites for an opening/vacancy. Dig up your contacts in these companies and forward your resume to the respective people. If you are getting call back for the interview, you are fine – but if you are not, then again work on your resume. Also dig up more contacts and keep trying till you get an interview call. Once you get a call for the interview – do nothing else but prepare for the interview. I have written a few articles on this website for various profiles in finance; go through them and start preparing! I hope this guide gave you clarity on the jobs, salaries and internships offered by the Big Four firms. In case you have any questions, please do not hesitate to write back. For Interview Preparation, focus on your profile. You need to convince the interviewer that this career is what you love and you will be here for a long term. hello sir, will the big four take a BBA graduate? Please check the company website for the requirements. We provide placement assistance after completing our program. I would like to know do i have any chance to get a job into such ca firms? 3.Certified Anti-Money Laundering Specialist(CAMS) from ACAMS(USA). I do have also 11 years private banking experiences(Branch experience ) only. Please contact them through official site or network. My query is that these big four company recruit for article ship training for cost auditor????? Please check their site for this. Also, you can start networking on LinkedIn. Plz hlp me .. nd tell which one of the big four firms is good for internship ? All are good. Please contact them through their official websites. Please visit their official website. Alternatively, Network using LinkedIn. Thanks for your very well written and informative article. I have two question to ask you. -Is there any scope for Engineers to join these Big 4 farms? -Are the salary range mentioned in the article applicable for India? 2. Please check Salary or Payscale sites for the updates. Best way is to contact on the official email id/ phone number and ask them directly. My marks are not upto the mark and I am pursuing Company Secretary course .Will I get a job in these brands in finance or accounts . Please visit the company’s website and check their eligibility criteria. Sir I m a class 12 student. Just want to know that I want to do ACCA . is there good opportunites of ACCA in big 4,s in India. The ACCA certification WITH practical skill have good scope. I am complete my Part Time MBA (Finance),M COM,LLB and pursuing for CA(IPCC) and I have not any job experience (fresh)and I am 31 yr old. 1) Can I get job in any good company at this age? 2) can I continue to do CA or leave it? Please focus on learning practical skills that will help you get a job and earn money. Please check our Financial Modeling and Investment Banking program. I am completed M.com and CS Executive program from Agra and i had 6 month work experience of risk and compliance audits of life insurance co.
Now i am looking for a job in Big4. Is there any opportunity for me? You may contact them directly through their official websites. Use LinkedIn and even Facebook for networking. Apply to these companies directly through their official website. I am a young student dreaming to join one of the big four companies. Can you help me in knowing which company would suit me best? All these companies are equally good to start your career with. It’s your role that matters. I am a Company Secretary with 3 years post qualification. I will be shifting to New York in next few months. I have started my CPA studies. Can my CS work exp be counted. Definately i will have to go for internship being Non finance background. However I wish to work with Big 4. It’s better to check the country specific eligibility criteria. CPA is a better option. Senior manager’s salary in pwc. Can I know which is the best place to work as an audit trainee? Is EY or KPMG? Because I’ve selected for both firms to work as an audit trainee? Which one I should prefer? I am an ACCA affiliate and currently searching for an internship in one of the big fours. I have applied time without number but to no avail. I don’t know what to do no more. You will get an email only if you’re selected. Is there any chance for Only Commerce Graduates from Mumbai University?Can a Graduate Who is not doing any professional program apply for these Big4? You need to check their eligibility criteria on their official website. Sir can u please tell that the above mentioned salaries are for a month or a full year ?? sir I have written my intermediate (both group) exams..waiting for my results..I have appeared for second attempt. If I am successful in this attempt .. Could I be able to do my articles in Big-4 companies??? Hi, i would like to know with whom and how i should make a contact to get an internship within the Big Four companies during summer? You need to apply through their online portal. I have just completed post graduation this year and have appeared in ca final examination ( result awaiting) . I trying to plan out the next step , should it be pursuing MBA or CFA or CS or should I start working and afterwards think of doing any other course. Start working, gain some experience and then you can think of additional qualifications. I am M.B.A. in Finance and working in GENPACT since July 2014. Can I apply for the Associate role in Big Four ? Apply directly through their website. I am Graduate and CA Intermediate, training completed want to start as a fresher in companies. How I get update with those bigfours or big outsourcing companies recruitment also give me some companies to join It would be helpful for me……………..plz tell. You need to visit their website and send your resume to the email id mentioned there. You can also apply to companies mentioned in this list. Hi Sir, I have my CPA and about 4 years of auditing experience from a very small local CPA firm. I really want to get into any NY, NY big four. Do you think I have a chance? If so, should I try as an associate or a senior? Thanks! Yes John. You surely have a chance. I think you should try for senior. what are the procedures for applying at the big four firms for a training programme for chartered accountant , its for my first time. I have almost 4+ years of experience as Executive Assistant in on of the leading big four, I would like to change the job, hence my package is very less compare to other EA’s, since I am having 10+ experience and am a graduate + MBA, is there a chance I can give a entry level to HR. I wouldn’t recommend trying for entry level positions for you. Go for jobs which have more transferable skills. I have completed CA in nov2014 in first attempt and done my articleship in taxation and also want to make my career in taxation only. Is it possible for me to join big4. what can i do for that??? Yes. Start applying to the positions most suitable to you. Hello Sir, it is a good article. My son is appearing for CA final in May, 2015. He wants to pursue MBA after CA. Whether it is good or to join in job after CA. Whether there are any more opportunities CA with MBA and the payment. He should gain 2-3 years experience before MBA. He can then try for top-20 business schools in India or abroad. Read about the person who did ACCA and worked with KPMG. Sir the article was quite informative and learnt many things. I am right now doing my B.com( 2nd year) from Seethalakshmi Ramaswami College, Trichy, Chennai. I am seeking for internship in these big fours ( mainly in KPMG). Might you please tell me all the information regarding it and things they would actually consider. I will await for your reply. If I were you, I would visit KPMG site and check their eligibility criteria. If I fit in the requirement, I would shoot an email to them. Is it possible to go abroad after joining as a PWC employee in India?? It completely depends on the role and responsibilities. Please visit the company’s site and check the eligibility criteria. I am doing ACCA,and wish to have a job in BigFour. I wanted to know about starting salary for an ACCA affiliate in BIG FOUR. Salary range changes every year for every role. Please visit Glassdoor and PayScale to check the same. Hello sir, i am pursuing CA and studying for IPCC, will give my paper in nov 2015, sir please kindly inform me how can I apply for articleship in one these big firms? and how should i prepare myself for such big firms? Best way is to contact them online and ask the criteria for articleship. I did my CA in Nov 2011 in first attempt before completing the age of 21 year. Afterwards I started preparing for govt exams and did clear 5 of them but didn’t join due to remote locations. Now I want to work for big 4. So what should i do to start my career. Just help me out. Best way is to visit company sites check different roles they have. Check which role is suitable to you and send your profile with a professional cover letter/ email. Next, you can build contacts with decision-makers of these companies on LinkedIn. Thanks for you reply sir. But the problem is that how will I overcome this 3 year gap and get a good job using my CV? You need to convince the employer that you made good use of these 3 years to invest in yourself and so now can add more value to the company. I have MBA- Finance from MKU University India by Distance Mode. Currently I am looking for some good course in US to get good job in india As currently I am on H4 visa in US. Please suggest me some good courses which help me to find good career with in India when I will back. Join our 6-week program in Delhi, India if you’re looking for jobs in core finance in India. Distance education won’t give your practical skills required to perform a a job. Join a full-time program if you’re serious about your career. I have a question:- I have 3.5 years experience in Accounts Payable and currently working in Genpact. So I wanted to know that are these top 4 companies hires Accounts Payable’s candidates. And if yes then what should I do now. The requirement of every company changes project-wise. You need to check the company website for formal announcement. I am working under CA from past 5 years as a tax analyst and senior associate. now i am looking to work in a big four and trying to get into PWC or KPMG but the required qualification is CA for the post of Tax analyst/Associate etc. Kindly help me , what should i do ? how should i get into a Big four ? please help. You’ll to fulfill the eligibility criteria. Each company/ role has a different eligibility criteria. Please check the websites. Your article is very helpful. Its my dream to work with big four. SIR I m pursuing ca final second group.. I had already CLEARED my ca final 1st group. Apply to these companies through their websites. I am currently working as an Analyst with market data provider (the USA based company). My main responsibility is to work on different type of financial security research in terms of reference data and pricing. Just want to check if my skill can be considered in either of 4 companies? For which role you want to try? Why don’t you visit the websites of these companies and check which role suits you the best? The companies update their requirements regularly so check when you’re ready. Nice to meet you Sir. I find your article useful as I am now looking for extra information on how I should get myself prepared for the Partner Interview for PwC Advisory Associate. Would you mind sharing with us how we should do to win the final stage of assessment? Many thanks for your attention and efforts! Will write a separate article on that. For time being, please make use of sites like Glassdoor. Sir i’hv clear my ipcc both group in single attempt and i am doin graduation final year from correspondence as well..so i wanted to ask about my articleship..did they guyz recruit articles?? You need to be at least graduate to apply for internships in Big-4. I have completed my m com from jamia milia islamia delhi in 2011 after that I was preparing for various government exam so I have a huge gap now what should I do to start my career ? Have you started applying for jobs? I just got call that i am selected in PWC as Tax Associate in Bangalore. Do you know the package for this post? Congratulations! I’m not aware of the package. I want to do training in one of the big 4 companies. It is important to clear ipcc in first attempt to get training in big 4 companies? What kind of training you want to do in Big 4? Your information is very helpful and impressed, how can you know these about Big Four? Right now, I am a Junior and trying to get an internship during studying in university. I applied a tax internship at PwC and got rejected; however, she, the recruiter, asked me to apply back in spring 2016 and also offered me other internships which are not related to tax accounting. She used to be my senior classmate at university, and I see her so nice to offer me other opportunities. So my question is I want to keep good relationship with her, of course professionally. So is it possible? and how should I do? Yes, you should develop your professional contacts with recruiters. Add her in your social networks (with her permission) like LinkedIn, Facebook, Twitter and so on. Keep your online image clean, friendly but professional. I am an mba specialized in finance, i am a fresher and placements are coming in my college can you please suggest me more on how to prepare to get into the big four companies regarding the grounds for development in communication skills and group discussions. This article is helpfull to many aspirants. As far as communication and group discussion is concerned, try to read recent corporate case studies. Your focus should be basic accounting, finance, math, logic and reasoning. Your thought-process and solution generating ability will be judged. Your article is very helpfull. Its my dream to work with big four. I have done my ACCA and currntly i am working as team leader in a KPO which provides accounting services to clients in U.K. Please guide me for which post should i apply for that will be suitable for me in big 4 ??? I got my degree in accounting and auditing in Mexico. I worked for PwC Mexico in 2011-2012. Now, I live in the US and I would like to apply for a job in PwC or one of the Big Four. Do you think I have a chance to get a job in one of these companies even if my degree is not from an American university? For that you need to contact the companies and inquire about this thing. These are global accounting and consulting firms. Please check their websites and apply for a suitable role. Hello sir, its a very good article. I have gathered a lot of information . But sir i would like to ask u how can i contact big four firms for my articleship. I have cleared my ipcc may 2014 in first attempt. Can u provide me some contacts. Check this article for networking. Hello, I’m a younger student, aspiring to brighten my future. What does ipcc mean? IPCC = Intermediate (Integrated Professional Competence) Course. Check this page (http://www.icai.org/post.html?post_id=3924) for details. I wish to know among all the Big 4, which is the best company for working? Who cares their staffs more? I think that’s very subjective. About working, check their HR policies and talk to people before you join any company. Hello sir, im very much glad to visit ur site. Its very informative. I like ur articles. Here i need a list of International CRA.